There’s a lot to love about America and its people: their pioneering spirit, their entrepreneurship, their ability to think outside the box, their passion for the arts, etc. Increasingly, however, as time goes by, I find the things I don’t like about living in a nation that has long since ceased to be a sanctuary for freedom are beginning to outnumber the things I love. Here’s what I don’t like about living in the American police state: I don’t like being treated as if my only value to the government is as a source of labor and funds. I don’t like being viewed as a consumer and bits of data. I don’t like being spied on and treated as if I have no right to privacy, especially in my own home. I don’t like being bullied by government bureaucrats, vigilantes masquerading as cops, or faceless technicians. I don’t like being railroaded into financing government programs whose only purpose is to increase the power and wealth of the corporate elite. I don’t like being forced to pay for wars abroad that serve no other purpose except to expand the reach of the military industrial complex. I don’t like being subjected to scans, searches, pat downs and other indignities by the TSA. I don’t like VIPR raids on so-called “soft” targets like shopping malls and bus depots by black-clad, Darth Vader look-alikes. I don’t like fusion centers, which represent the combined surveillance efforts of federal, state and local law enforcement. I don’t like how the presidency has developed into a neo-monarchy replete with all the luxury and lasciviousness of the feudal lords of old. I don’t like politicians who spend most of their time running for office, fundraising and enjoying being feted by lobbyists and corporations alike. I don’t like being kept at a distance from my elected representatives, including the president (a.k.a. the Emperor). I don’t like free speech zones, roving bubble zones and trespass laws that restrict Americans’ First Amendment rights. I don’t like laws that criminalize Americans for otherwise lawful activities such as holding religious studies at home, growing vegetables in their yard, and collecting rainwater. 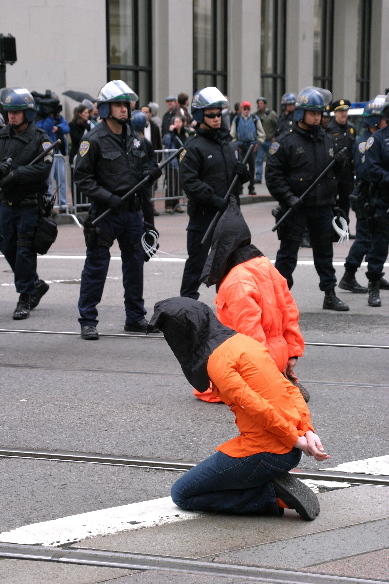 I don’t like the NDAA, which allows the president and the military to arrest and detain American citizens indefinitely. I don’t like the Patriot Act, which opened the door to all manner of government abuses and intrusions on our privacy. I don’t like the Department of Homeland Security (DHS), which has become America’s standing army in direct opposition to the dire warnings of those who founded our country. I don’t like military weapons such as armored vehicles, sound cannons and the like being used against the American citizens. I don’t like government agencies such as the DHS, Post Office, Social Security Administration and Wildlife stocking up on hollow-point bullets. And I definitely don’t like the implications of detention centers being built that could house American citizens. I don’t like America’s infatuation with locking people up for life for non-violent crimes. There are over 3,000 people in America serving life sentences for non-violent crimes, including theft of a jacket, siphoning gasoline from a truck, stealing tools, and attempting to cash a stolen check. I don’t like paying roughly $29,000 a year per inmate just to keep these nonviolent offenders in prison. I don’t like the partisan nature of politics today, which has so polarized Americans that they are incapable of standing in unity against the government’s abuses. I don’t like the entertainment drivel that passes for news coverage today. I don’t like Department of Defense and DHS programs that transfer surplus military hardware to local and state police. I don’t like government programs that reward cops for raiding homes and terrorizing homeowners. I don’t like local police dressing and acting as if they were the military while viewing me as an enemy combatant. I don’t like feeling as if we’ve come full circle back to a pre-Revolutionary era. I don’t like answering to an imperial president, who operates above the law. I don’t like the injustice that passes for justice in the courts. I don’t like prosecutors so hell bent on winning that they allow innocent people to suffer for crimes they didn’t commit. I don’t like the double standards that allow government officials to break laws with immunity, while average Americans get the book thrown at them. I don’t like cops who shoot first and ask questions later. I don’t like police dogs being treated with more respect and afforded more rights than American citizens. I don’t like living in a suspect society. I don’t like Americans being assumed guilty until they prove their innocence. I don’t like the fact that 38 states require that a property owner prove his innocence when police have laid claim to it in a civil forfeiture proceeding, whether or not that individual has done anything wrong. I don’t like technology being used as a double-edged sword against us. I don’t like agencies like DARPA developing weapons for the battlefield that get used against Americans back at home. I don’t like the fact that drones will be deployed domestically in 2015, yet the government has yet to establish any civil liberties protocols to prevent them from being used against the citizenry. Now there are those who would suggest that if I don’t like things about this country, I should leave and go elsewhere. And there are certainly those among my fellow citizens who are leaving for friendlier shores. However, I happen to come from a long line of people who believe in the virtue of hard work and perseverance and in the principle that nothing worthwhile comes without effort.